Puff-n-Pass is a socially interactive game for people over 18 who want to meet and make new friends. Puff-n-pass Discs’ are an amazing novelty pipe that can fly!!! It is also a great way to meet people by flying your Puff-n-Pass to potential new friends! Retailers receive wholesale pricing and can order custom printing with their logo on Puff-n-Pass to personalize their flyers, creating repeat business to their stores directly! Puff-n-Pass was founded in 2008 in Galway, NY by owner and Sole proprietor Victoria Kramer, who envisioned a flying disc pipe that could be manufactured in the USA and distributed through retail outlets worldwide. The idea for Puff-n-Pass flew into Victoria’s head five years ago while running her retail shop “Country Made Crafts/CMC Pipes”, which she has owned and operated for fifteen years. After you had the idea for Puff-n-Pass, how did you bring it to market? We went through several prototypes, and through trial and error, we identified those designs we felt were perfect. We have a durable product to offer to the smoking culture, and a new fun product line of pipes. When the sales in my store took off, I felt it was only fair to offer other stores the same opportunity to increase their pipe sales as well. This was the design that took the average smoker by surprise, and has reached new heights that even I was surprised by. The company has taken over more space as it has continued to grow, and we have a few employees who have been very dependable and supportive of our growth. We are currently offering a new line to our already popular Solid and Color Splash Puff-n-Pass, the Puff-N-Pass Juniors!!! They are a smaller 5” flyer, where the regular ones are 9”. They are our pocket size flying pipe! We had requests from disc golf players for a “line marker”, which the “Juniors” are the perfect size for! Not to mention that fact that they easily fit into a purse or beach bag for fun in the sun! Who is your current target market, and has that market changes since your start? Anyone who is 18 or older and wants to get outdoors to connect with friends by playing the Puff-n-Pass Game! The game is included with each and every pipe purchase, whether it is from your local store carrying Puff-n-Pass or online. We have been selling to stores across the USA, and in Canada through our distributor in British Columbia, but the biggest market change we’ve seen is the inclusion of golf disc players, and retail stores who cater to disc golf players. We think Puff-n-pass Junior will be a big hit as a line marker while they play disc golf, as well as off the course for fun. If you’re a retailer and would like the newest flying pipe in your store, just give us a call to get started! How would you describe your product line to retailers and distributors? We are a family run and operated business that proudly makes Puff-n-Pass and all parts used are also made in the USA. We currently offer 20 colors to choose from, five (5) of them are color splash, which look like they were tie-dyed. The other colors are available on our web site www.puff-fpass.com for viewing. We have a limited supply of additional colors such as Neon green; neon orange; neon yellow and forest green. We sell wholesale to stores with proof of license, or whatever is applicable in their particular state. Once established, stores can order online at the web site with a code provided with their first order. We always offer orders via telephone at (518) 882-1205. 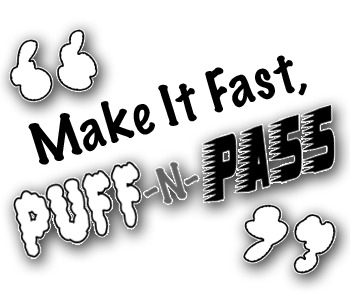 We are now offering Puff-n-Pass Jr which is our new product line as well as “GLOW-N-DARK” Puff-n-Pass! These new lines have proven to be big sellers in our retail store!! Both have been a big success to our current and steady regular Puff-n-Pass Designs. Speaking of Orders what is the best way for retailers and distributors to purchase Puff-n-Pass? Retailers wishing to carry our line should call me, Victoria, at (518) 882-1205 to place their first order and inquire as to what specials we are currently offering to first time buyers, or email me directly at victoria2cmc@gmail.com. We mainly sell wholesale to retail stores. We are currently offering customers the opportunity to call us for stores across the USA that carry Puff-n-Pass, so retail purchases can be made locally instead of directly through us, thus saving the buyer the added cost of shipping.